← Can a Computer Write a Novel? A few months ago, I had dinner with a colleague who works for a large printer based in the Midwest. He had just attended a conference where graphic novels were all the buzz. He indicated his company was seeing more orders for books of the graphic novel genre. His comments made me curious about this visual form of fiction. Any trade paperback or hardcover book consisting of work in comic-book form. The popularity of the graphic novel can be gauged by its soaring sales. Andrew Grabois, posting in Beneath the Cover; cites an industry study which shows that sales had grown almost five fold from $75 million in 2001 to $330 million in 2006 in the US. The primary channels for graphic novels are comic shops and retail bookstores. Originally, the majority of sales were made at comic shops. But now bookstores outsell comic shops about 2 to 1. According to Books in Print, in 2006, 2,711 new graphic novels were published, a 16% increase over 2005. Grabois notes that manga, a Japanese version of the graphic novel, is the catalyst for growth. Also driving sales is a new focus on material for girls and juvenile readers who play video games and are fans of TV based anime. In Japan, manga (the Japanese progenitor of the graphic novel) accounts for 22 percent of all printed materials, comprising an industry with annual sales of $4.2 billion. Yet, according to an article by Daniel Pink, entitled Japan, Ink, in Wired 15.11, sales of traditional manga In Japan – its place of origin – are sagging. In his insightful look at the Japanese manga market, Pink lays out the causes and what may be the solution for this important Japanese entertainment staple. Using every skill and storytelling method Jacobson and Colón have learned over the decades, they have produced the most accessible version of the 9/11 Report. Jacobson’s text frequently follows word for word the original report, faithfully captures its investigative thoroughness, and covers its entire scope, even including the Commission’s final report card. Colón’s stunning artwork powerfully conveys the facts, insights, and urgency of the original. Where could the graphic novel format go next? Here are some thoughts..
New themes – As young readers now consuming graphic fiction grow up, so will the genre. No doubt the themes and illustrations will expand as more women read graphic novels and look for reading that mirrors their interests. 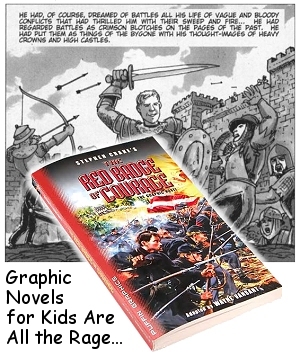 New uses– The graphic novel / manga format is being used to enhance non-entertainment experiences. For example, Tokyopop and Kaplan publish graphi novels aimed at building vocabulary as part of a test prep regime for high schoolers. Greater recognition – Graphic novels are beginning to win awards – e.g. Art Spiegelman’s Maus won a Pulitzer Prize. Serialized stories delivered online – Increasing bandwidth could make the graphic novel an attractive candidate for serialization via e-mail. Small screen – The increasing screen resolution and software capability of cell phones lends itself to the graphic novel. This is already happening in Japan. 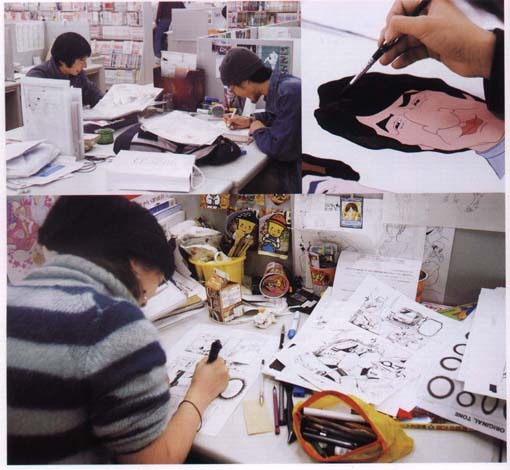 Dojinshi manga– This refers to self published manga, now the rage in Japan. According to Daniel Pink, it represents a remix of published manga by individuals who are both fans and aspiring authors. The dojinshi avoid being prosecuted by publishers by not publishing too many copies (usually 20-30) of any work. The publishers use the sales of these amateur works as a way to see what themse are becoming popular and to find new talent. It is difficult to say whether the dojinshi concept will ever find a home in the more litigious American and Western European markets. This entry was posted in book marketing, publishing strategy, readership strategies and tagged graphic novel, manga. Bookmark the permalink.